Hello again fellow scrappers & bloggers. I have a brief tutorial today that's been hanging around in 'draft' mode in my blog for months. I've known how to make these dogwood flowers for a while now & have never gotten around to posting a tutorial...well, here it is! They're really easy to do. All you need is a balloon punch (I'm using the balloon punch by Martha Stewart), a marker, a 1/4 inch hole puncher, 1/2 inch glue dots, Stickles, 1/2 inch circle punch, a mouse pad, shaping tool & any kind of sun punch for the center of the flower. I'm using sun punches in 2 different sizes by the Punch Bunch. If you do not have a sun punch you can also use floral sprays/stems if you have them. Start off by punching 4 balloons. These balloons will be your petals. With the 1/4 inch hole puncher make a half moon punch in the top center of each petal. With your marker outline the edges of the half moons for each petal. Next you're going to shape each petal. Use the bottom side of any mouse pad for support. In a circular motion start moving around the flower with your shaping tool while applying some pressure in order to cup the flower. You can use the eraser side of a pencil for this if you don't have a specific tool for shaping. The tool I'm using came with a paper crafting tool kit made by the Punch Bunch. Once your petals are shaped, take the 1/2 inch circle & place a glue dot on it. Then start placing your petals on the circle. Here's your flower with all four petals adhered to the circle. Now to make the center. You'll be using 4 sun punches in total for the center. Two large & two small suns. For all 4 suns snip in between one sun ray all the way to the center of the sun. With a pair of tweezers take one end of the sun & start rolling it towards you. Roll it all around until you reach the other end. This is what your suns should look like after you've rolled all four. Proceed to adhere the suns to the center of your flower. 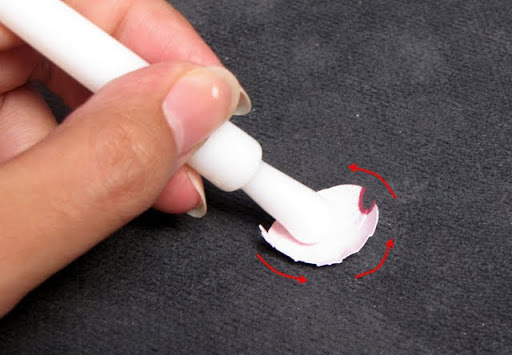 If you do not have glue with a fine tip, you can use a toothpick to place a small dot of glue to adhere each layer. I used my tweezers to place each layer since they're very small. The rest of how you decorate your flower is up to you. I tend to use Star Dust Stickles around the half moons & dots of Lime Green Stickles to further decorate the center of the flower. You can also add veins to them with an embossing pen--the finishing touches is really up to you. Here are a variety of dogwood flowers in all colors. You can use solid colors or pattern--it's all up to you. You can also leave the flowers with or without leaves. Hope you all enjoyed this tutorial. Que buen Tutorial!! me gustan esas flores mucho!!! te quedaron hermosas! gracias por compartir!!! These flowers are adorable!! I've never seen them before. Who would have thought that a balloon punch could make such a cute flower. Thanks for sharing. WIll have to try this. I don't have a balloon punch but might be able to find something similiar with my cricut. thanks for sharing..these are beautiful!! Great tutorial! Very detailed and so creative of you to use balloons! Thanks so much for sharing!!! That is really neat-o girl!! Thank you for sharing, these look great!!! Que lindas florcitas Kay!!! cuanto me gustaron!! y como le hiciste el centro esta precioso!! Un abrazo y todo mi profundo agradecimiento por todo lo que has hecho para ayudarme!! Love the tutorial and the flowers. This is definitely a must try. You are brilliant!! I am so glad I found your site. I have been looking for the perfect flowers for a bridal hair clip and it may sound crazy but I think this will work. Of course, I will have to seal them really well but I love these...thank you!! If I end up using your method I will send you a picture of the clip!